The point of this particular blog isn’t to criticize Mayor Baraka and his work to remove Ms. Anderson – but The Newark Report would like to point out that the deliberate timing of that very public letter set in motion a series of events that eventually ended with Anderson leaving Newark. January is a time when people and the Press are focused on issues and the Baraka letter set a tone for the rest of the year. Now lets contrast the timing of the Anderson letter to the timing of a more recent letter by Mayor Baraka, which he deliberately buried during this past Holiday Season. 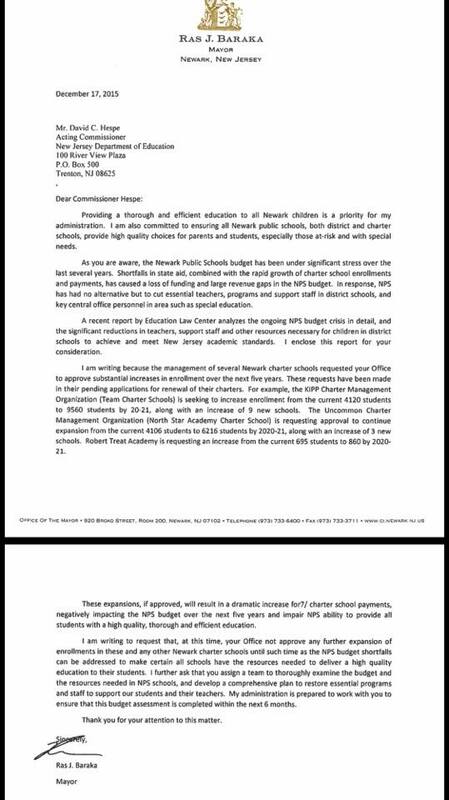 In an unprecedented letter dated, December 17, 2015, to Education Commissioner David Hespe, Mayor Baraka makes clear what many in Newark have feared – his utter unwillingness to support the Newark parents of public charter schools. So the City of Newark is ending the year with 104 homicides and the end of the year the reflections and priorities of our Mayor is banning charter schools? Really? Lets be clear – these words about public charter schools hurt only one group in our city – the Newark families who actually play by the rules, remain in our city and stay committed to our public schools. The Mayor’s point of view is now crystal clear for all to see. While he cowardly issued this letter during the Holiday Season, the tactic was luckily not missed. For the thousand and thousands and thousands of Newark’s voting parents who depend – or hope to depend – on public charters schools, this sneaky “December Surprise” was a direct slap in the face. 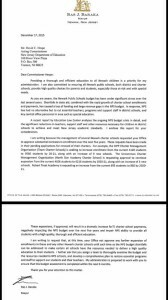 In case there was any doubt about the Mayor’s plans for our kids, we ask everyone to read the letter for themselves. This request from Mayor Baraka will not be a complete shock, especially when you look at his controversial ties to well financed ideologues like the Newark Teachers Union (NTU) and the New Jersey Education Associations (NJEA). Special interests outside of Newark, the same special interests that helped get Baraka elected, have attempted to create what is called a “charter moratorium”. In response, the Newark City Council passed a resolution sponsored by Councilman Anibal Ramos Jr. opposing any such moratorium, by a vote of 7-2 with Council President Mildred Crump and South Ward Councilman John James voting no. So Mayor Baraka’s sneaky Holiday actions not only hurt parents, but it challenges an over welling majority of the City’s elected officials. But what The Newark Report found most interesting is the timing of the Baraka letter. Unlike the Anderson letter that we referenced at the beginning of this post, Mayor Baraka chose to bury this most recent request during the end of the year. Rather than be transparent about his anti-charter sentiment, the Mayor decided to hide. In doing so he was able to initially dodge concerns from actual voting parents or create any more controversies for himself within Newark. The last two weeks of the year are often a time when elected leaders slyly address controversial policies and initiatives. The thought process is simple. It is late December, people are occupied with the Holidays, kids are out of school, families are celebrating, and some people are even out of town. This “December Surprise” was a win-win for the Mayor. He was able to pull one over on the residents of Newark and pay back some political debts, without causing any concern from Newarkers. In future posts The Newark Report will showcase the thoughts of all parents regarding Newark schools but in the meantime, we wanted to showcase where our Mayor stands on this issue.